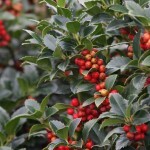 A compact pyramidal evergreen holly. The foliage is glossy and dark green. It produces bright red berries from late summer through winter. It needs a pollinizer such as 'Castle Wall'. Prefers full sun to part shade in a well-drained soil. Can be pruned if needed. 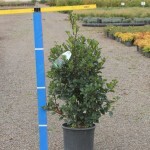 Great for specimen or hedge plantings. PP 14,310.